Nopaleses used not only as food but also as a powerful natural remedy for many ailments such stomach, diabetes, colds, high cholesterol, as well as being excellent food for diabetics. Nopaleses rich in amino acids and is very nutritious, it also contains fiber, minerals, magnesium, iron, vitamin B and vitamin C, water, protein, carbohydrates, fat, and beta carotene. Native Americans in Mexico may have used plants from since 12,000 years ago, used to treat wounds and stomach ailments, constipation and for the treatment of colds. Modern research shows that nopalesses good for the treatment of diabetes. 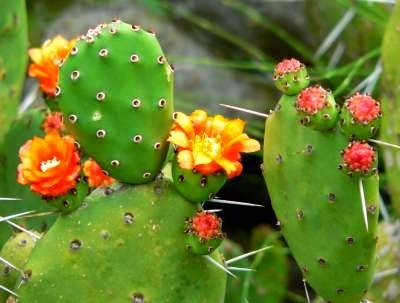 studies in the 1990s on laboratory animals showed that lower blood sugar after consumption of this cactus extract. Herbal nopaleses medicinal properties make it as a laxative powerful anti-inflammatory, to reduce the symptoms of a hangover. Preliminary research indicates that nopales may be useful in reducing inflammation, treating stomach conditions, reduce blood fat and cholesterol. Further research is being conducted to demonstrate the effectiveness of this nopaleses plants.